Approximately four years ago, a workshop for antiquities forgery was discovered near the village of Lesh­nitsa, Lovech region. 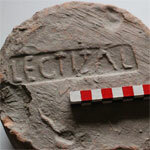 A significant number of bricks and flat roof-tiles (tegulae) (approximately 70 in number) was found all bearing the stamps of two legions from the territory of Lower Moesia Province (Moesia Inferior) – legio I Italica and legio XI Claudia. These legions were regular military and tactical units in the province until AD 376-378. After the Gothic War, important changes took place affecting the quantity, the composition and the structure of the military contingent along the Lower Danube. The legions’ intensive activities required huge amount of construction materials. Distinct or unclear stamps can be seen on some of the bricks and the tiles. They either mark the military unit only or the unit and the name of the producer or the person responsible for the production. The bricks and the tiles I examined were almost intact, but a large number had their corners broken. After a careful study of the “production”, it became evident that while one part of it was authentic, another part was is modern imitation. The differences were distinguished by following certain criteria. A thin or a thicker (not thicker than 5-6 mm) layer of mortar covered the authentic bricks. Imprints left by domestic animals were also visible. Undoubtedly, these bricks were ancient buildings’ remains. The authentic artifacts had cracks and abrasions and small parts were missing. The depth of the stamps varied, and some letters were difficult to distin­guish. In contrast, the modern imitations were well shaped in moulds; the metal stamps were of good quality, and there was no mortar on the bricks. However, the temperature of firing was close to the original, explaining the right colour of the bricks and the tiles imitations. The color was also determined by the clay resources in the region. In general, the colour of bricks and the roof-tiles varied between brown-red to pale-red. Many of them were marked by three lines of finger tracks, running diagonally over their upper surface. Most of the stamps belonged to Legio I Italica. The imprints, both positive and negative, differed in size as did the letters. Their depth differed as well, varying from 2 to 3 mm. The stamping was fast and the pressure on the unfired clay was not uniformed. The original stamps were made from wood. Some stamps were made form metal, but it is impossible to ascertain whether they were authentic or forgery. The stamps were not always placed in the center of the bricks or the roof-tiles. A small amount of the production was stamped as a rule. The stamps were rectangular, and some were in tabula ansata. Round bricks for pilae of hypocaustum installation: d = 18.5 cm, thickness 8.5 cm; stamp – 13 х 3.2 cm; d = 19 cm, thickness 8.5 cm; stamp – 13 х 2 cm. The cuneati are bricks with square or more often rectangular shape. The thickness of both ends is differ­ent. They were mainly used for the construction of vaults. This is the first time such type of artifacts have been encountered. The vaults found at Ulpia Oescus (near the village of Gigen, Pleven region) were made from standard bricks, but the mortar which bound them served as cuneati. The sizes of the presented artifacts are as follows: 40 х 26 х h1 – 5, h2 – 7.5 cm (Fig. 8); 48 х 27 х h1 – 5, h2 – 8. The stamps are 13 х 4 cm large, and they are of a very high quality, undoubtedly made in a metallic mould. The bricks are considered authentic due to the mortar on their surface. In addition to stamps of the two military units, another type was also discovered – AL SOL – perhaps meaning AL(a) SOL(ensium)/AL(ae) SOL(ensium)? Such stamps were common in Dimum, Svishtov, Novae and Pliska. However, reliable information from 1st and 2nd century has not yet been found to confirm the exist­ence of this military unit. Did such unit exist in this period? Can we date these artifacts to the 3rd century? Was the stamp a private or a military marking? However, it has to be pointed out that in a later period, two cavalry units of limitanei are recorded in Notitia Dignitatum – XXXIX: “Sub dispositione viri spectabilis ducis Scythiae…Cuneus equitum Solensium, Capidava; XL: “Sub dispositione viri spectabilis ducis Moesiae Secunde … Cuneus equitum Solensium, Dimo”. Similarly, in the Late Antiquity, a lot of military units shared the names or part of the names of earlier period military units. The stamps should not be read in the Nominative case – LEG(io) I ITAL(ica); LEG(ionis) XI C(laudiae) P(iae) F(idelis), and not LEG(io) XI C(laudia) P(ia) F(idelis) but in the Genitive case. Thus, the proposed interpretation is LEG(ionis) I ITAL(icae) – (production) of Legio I Italica. In general, the stamps of Legio I Italica are dated back to the 2nd century, and those of Legio XI Claudia are dated back to the first quarter of the 2nd century. The question that arises is where the bricks and roof-tiles with stamps come from. The author suggests that they came from the region of Novae, situated near the modern town of Svishtov. A lot of similar production was found during the archaeological excavations at the legionary camp, the canabae, the vicus and neighbouring ter­ritory. Most of the production belonged to Legio I Italica, and only a small amount to Legio XI Claudia. Single artifacts bear the stamp of Alae Solensium. Although a part of the bricks and roof-tiles from the Lovech region are undoubtedly a forgery, it is beyond any doubt that they are imitations of authentic artifacts.